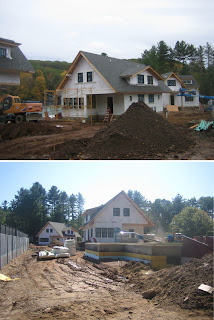 Windigo Architecture: Faculty Housing Goes Up in Massachusetts! Faculty Housing Goes Up in Massachusetts! 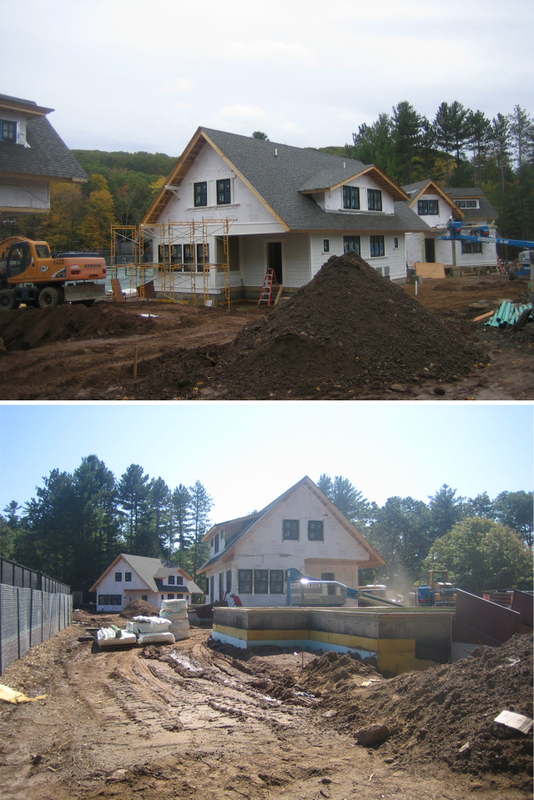 Windigo's Faculty Housing Village design for a private school in Massachusetts has made a lot of progress over the past 6 months. Four new single-family and two-family homes have been constructed to accommodate the needs the school and its growing number of incoming and long-term faculty. From design to near completion, we're here to walk you through the construction process and to show you where the project stands today! 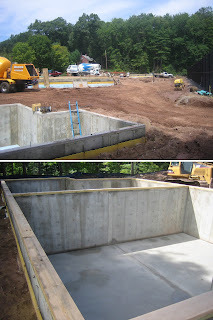 Sitework began during the summer, as earth was excavated and foundations were poured. During the same time the geothermal wells were constructed in order to provide a sustainable heat source for the housing complex. 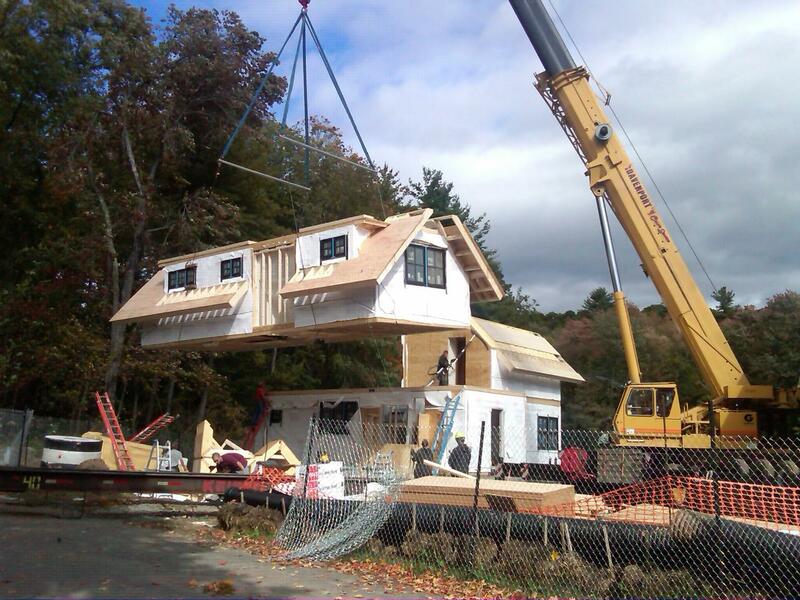 Meanwhile, the individual housing units were being custom-built at a modular facility in Maine. 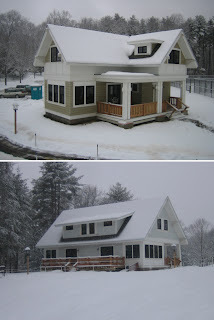 Using Windigo’s designs and specifications, a prefab company constructed the homes in small segments which would later be placed on a truck bed and shipped to the site. In Massachusetts the individual prefabricated segments were unloaded from trucks and hoisted into place using cranes and on-site workers. 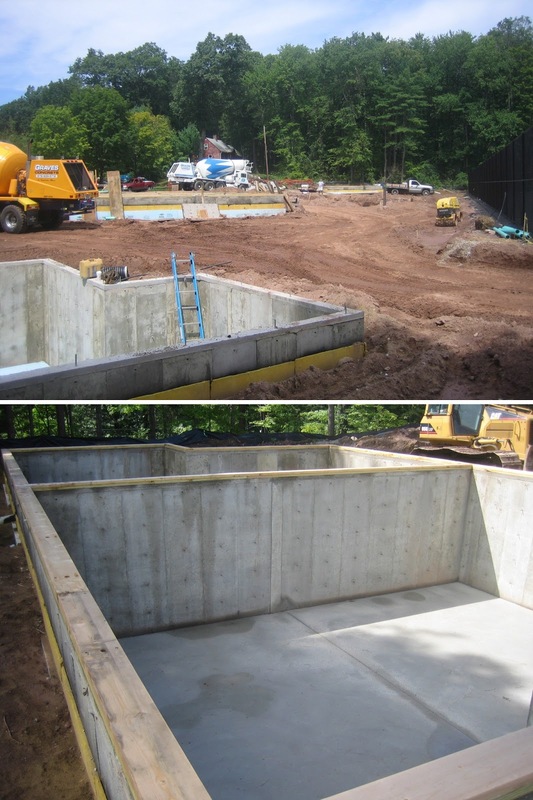 By using a modular system for construction, the amount of on-site work was greatly decreased. Once all the individual segments were pieced together, contractors worked to fasten and seal the seams in the units. 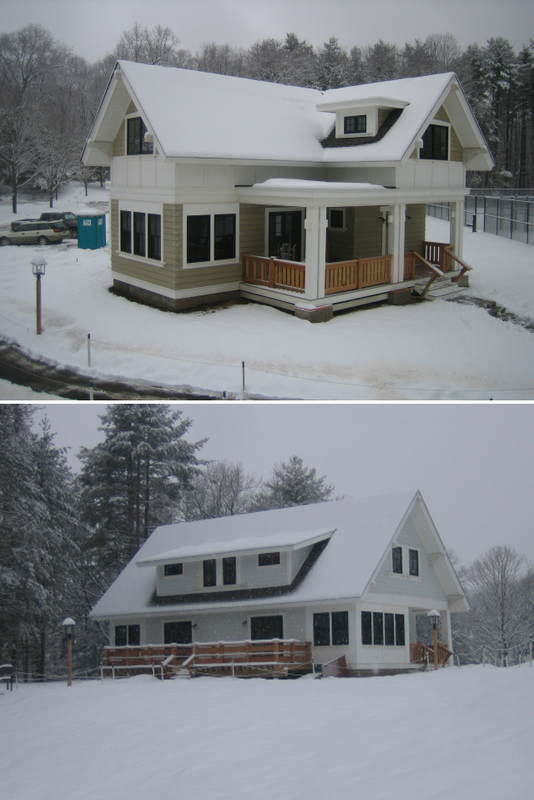 Later, porches for each home were constructed and the Hardi Board siding was installed. 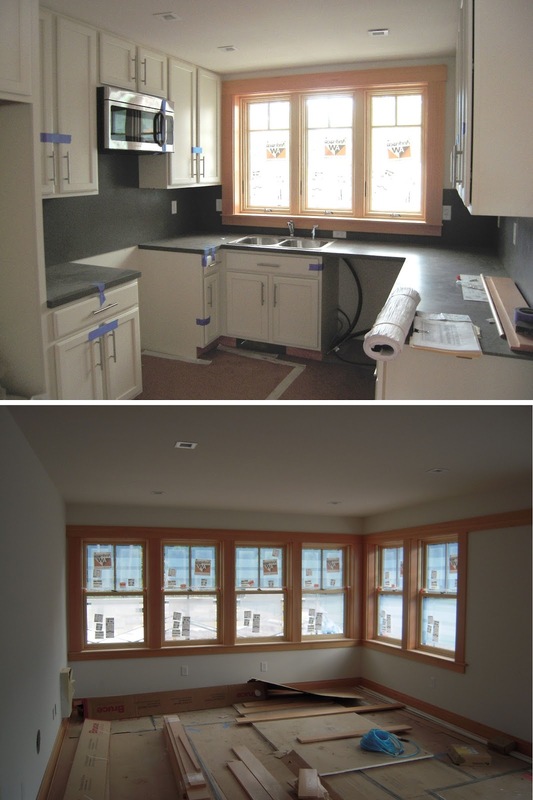 The majority of the interior spaces were already completed when the modular homes arrived at the construction site. 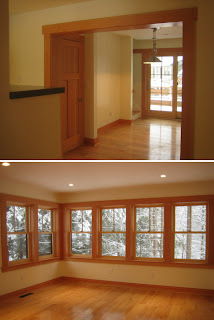 This included windows, base molding, hardwood floors, kitchen cabinets and lighting fixtures. On-site contractors installed plumbing for the kitchens and bathrooms as well as the stove, refrigerator, dishwasher, and other appliances. Epoxy flooring was installed in the basement of each home providing the possibility for the area to later be finished and used as additional living space. As the home’s interior nears completion and is cleaned up, we are now able to see the wood accents of home including doors, flooring, and moldings. 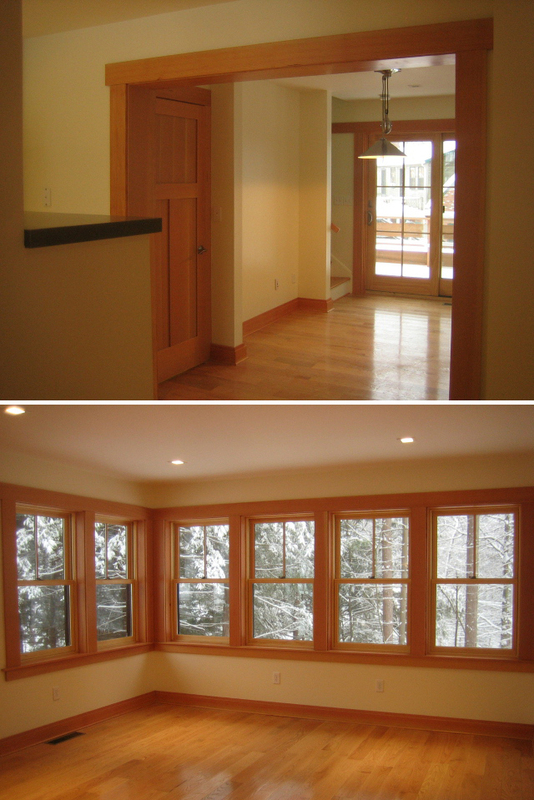 Many windows provide views to the surrounding landscape and campus and make the interior feel bright and spacious. The project is currently nearly completed and has already received a lot of positive feedback from the campus community. Our efforts to create an energy efficient housing village have been a success, as the tight envelope and thermal insulation have kept the homes warm during the latest snow storm. There have been many comments on the brightness of the interior spaces which was attained due to a carefully chosen site and solar orientation which maximizes daylighting. We look forward to the springtime when the finishing touches to the homes can be completed and the village’s new occupants can move in! Windigo Architecture LLC, is a full-service architecture firm in Morristown, NJ with an expertise in renovation and new construction and a passion for exploring innovation, preservation, and sustainability in building and design. Led by principal David M. Spence AIA, LEED AP, the firm serves clients in the New York Metropolitan area, as well as throughout the Northeast and Florida. We started this blog to give our clients and prospective clients an insight into the design and construction process and to share with you the things that we find interesting. Give us a call at 973.425.7680 and visit our website at www.windigodesign.com !